Images and storytelling are deeply ingrained within human history as ways of sharing ideas—it’s no surprise they’re are also effective for teaching and learning. On a mission to tell stories with data, Visual.ly lets you easily develop beautiful, compelling data visualizations and infographics—for free. Developed with the non-graphic designer in mind, Visual.ly offers pre-created graphics and templates so you focus less on image editing and more on crafting your story. Want to see your potential with Visual.ly? Here are 20 Great Infographics of 2012, created by people just like you. Also check out Visual.ly’s Explore database that contains over 35,000 infographics and data visualizations that you can share or embed for personal or non-commercial use. The awesome infographics you create will also be searchable through this database. Alignment with learning objectives Infographics should closely relate to your learning objectives without providing too many extraneous details. Ability to communicate important information Focus the information you provide on the most important points that students need to master. Cognitive skills and level of the learner Consider students’ prior knowledge regarding the infographic topic and data. Created in Visual.ly, the example below demonstrates how graphics effectively communicate complex concepts—in this case, time vs. distance, fall time, and impact velocity. With limited text and clean, simple images, these three concepts are clearly explained in a way that is relevant and fun for students. 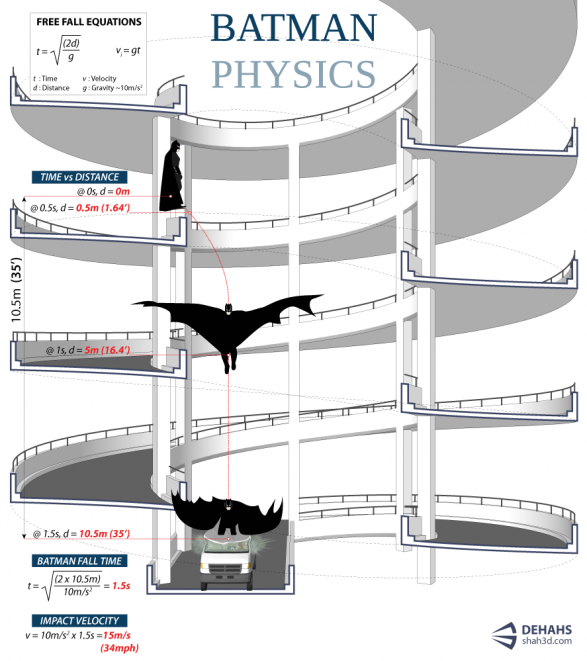 Batman Physics infographic by Dehahs. What are other tools you use to create data visualizations? How have you seen student learning improve through your use of images and visual storytelling?